The Russian minister of natural resources shares his experience of a visit to the Antarctic and talks about the challenges faced by those who work at research stations there. Russian Minister of Natural Resources Sergei Donskoi was one of the members of a Russian delegation which spent a week in the Antarctic in January 2014. The principal aims of the trip were to assess the condition of Russia’s Antarctic stations and the development of an Antarctic program, but for Donskoi it was also a revealing glimpse into the difficulties faced by Russians working on the frozen continent. It took the Russian government delegation more than 60 hours of flight time to travel to the Antarctic and back. The journey involved several connecting flights, with stops in Madrid, the Chilean capital Santiago, and Punta Arenas in the south of Chile. "From there we flew to the Antarctic - first to the U.S. stations Amundsen-Scott and Union Glacier Camp, and then to the famed Russian station Vostok," Donskoi says. "We were lucky to have favorable weather, which allowed us to get to all the polar stations on time. I had previously been to Antarctica, in 2009, on a visit to the Norwegian research station Troll. Back then we flew via Cape Town." Donskoi’s visit coincided with summer in the Antarctic, so the air temperature was quite comfortable, at around minus 30 degrees Celsius. "I was impressed by the colossal expanses of ice and snow, the mountain ridges, the very bright sun and the constant wind. The Antarctic gives you a marvellous feeling of freshness and open space,” says Donskoi. However, he points out that the unique natural environment in the Antarctic poses its own challenges. “There is virtually no humidity, the air is rare and depleted of oxygen because many of the stations are located at 2,000 meters or higher above sea level,” he says. “For example, Union Glacier Camp sits in the center of a mountain ridge - as does Vostok, which is built at around 4,000 meters above sea level. This is why for some polar researchers, acclimatization is accompanied by exhaustion and altitude sickness. As for me, I did not have any uncomfortable feelings." Donskoi says that the pay received by Russian polar researchers is lower than that of their American colleagues: "Our researchers are paid an average of 70,000 rubles ($2,200) per month, which is quite a modest sum considering the harsh working conditions and the high air fares they have to pay to fly back home." The absence of creature comforts is not the worst thing though. The Russian scientists are worried because of the looming uncertainty and lack of prospects since the federal program to fund Russia's Arctic presence was closed in 2013. This decision has jeopardized plans to overhaul the Russian Antarctic expedition's infrastructure – a particularly worrying development since scientific research on the continent is the primary mechanism supporting Russia's geopolitical interests in the region. Work is currently on to find ways to resume funding for Russia's Antarctic efforts. The current plan calls for the construction of a new Vostok station, which would be based on a modular design similar to those used by other countries. Interestingly, for various reasons many of the currently operational Antarctic stations have water supply problems - something unheard of to the Russian researchers. Donskoi explains: "Vostok gets water from melting snow. The foreign Antarctic stations do not use this method, hence the water shortages. As they say at Union: If you want to take a shower, go to the Russian station." Donskoi’s visit was not the first time that a Minister of Natural Resources had set foot on the southern continent. In March 2008, then-Minister of Natural Resources Yury Trutnev touched down at the Novolazarevskaya station as part of a Russian delegation including then-First Deputy Prime Minister Sergei Ivanov and then-Minister of Transport Igor Levitin. 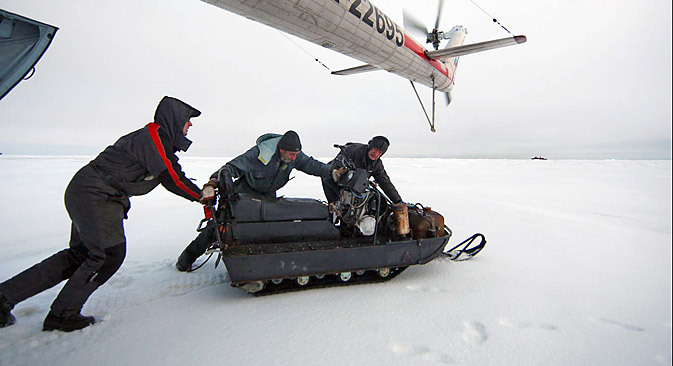 The officials were tasked with finding ways to improve transport for polar researchers and checking the correct functioning of the GLONASS navigation system – which was used to assist their aircraft to land at Novolazarevskaya. The 2008 visit represented the first time in Russian history that such high-ranked officials had made the journey to Antarctica.